Allegheny College was founded in 1815 by the Rev. Timothy Alden. By 1822 the library’s foundation was well established from the bequests of his Harvard friends the Rev. William Bentley (1820) and the Hon. 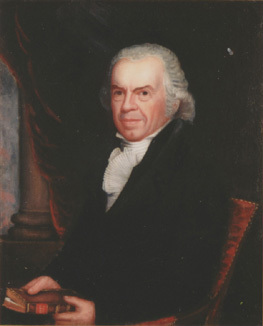 James Winthrop (1822). The collection also obtained books from Isaiah Thomas through donations, bartering and purchase. The Rev. William Bentley’s bequest came to Meadville in 1820. 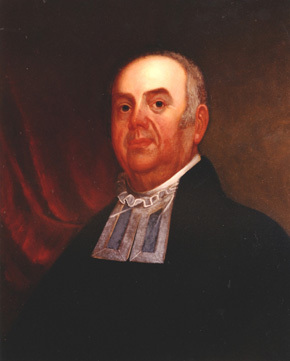 In his letter dated 6 January 1820, William Bentley Fowle wrote to Timothy Alden that his uncle, William Bentley, bequeathed to the young college all his “Classical & Theological Books, Dictionaries, Lexicons & Bibles to the College at Meadville, Pennsylvania “. On June 28, 1820, the Board of Directors asked Isaiah Thomas to assist Mr. Fowle in selecting “such Books as were contemplated by the noble spirited Testator for the alcoves of Allegheny College”. The books were sent to Philadelphia and then on to Meadville. In 1822, the Winthrop books came to Allegheny. The Hon. 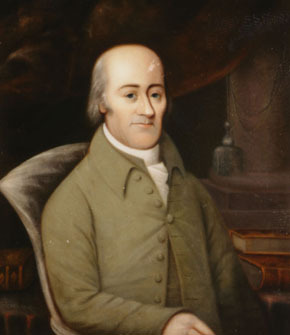 James Winthrop, a charter trustee and good friend of Timothy Alden, in his will of 1819, after designating parts of his library to others, willed “All the rest and residue of my books I give to the Allegheny College at Meadville in Pennsylvania whereof Rev. Timothy Alden is President, with my best prayers to God for the success and utility of the Institution”. This library not only contains the collection of James Winthrop but that of his father, John Winthrop, Harvard Hollisian Professor of Mathematics and Philosophy. Approximately 3,150 books were shipped to Meadville from Cambridge through Albany and Buffalo, New York. It took several months, and Alden paid $120.22. The library’s first residence was in Bentley Hall. In 1823, the Catalogue of the library was printed by Thomas Atkinson of Meadville. This publication caught the eye of many individuals among them Thomas Jefferson and John Quincy Adams. The library moved to Ruter Hall in 1853. In 1905, Reis Library was completed where the collection was housed in The Treasure Room. In 1976, the Lawrence Lee Pelletier Library in honor of the College’s 16th President was built. The collection was again moved into the Special Collections. In 1962, Allegheny College commissioned Edwin Wolf, to survey and report his observations of the Original Library of Allegheny College.